These are only a few sketches I did "in situ" for May. 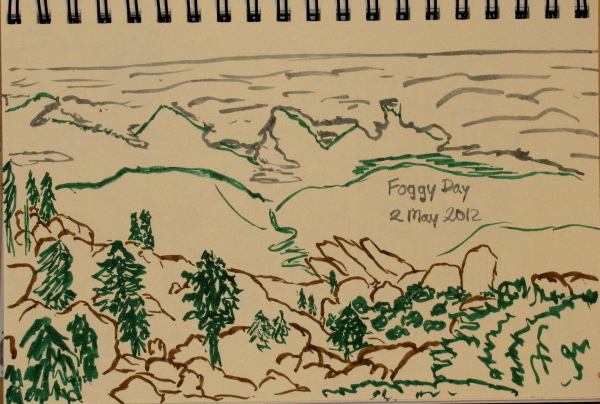 Fog oozing over the mountains viewed from the lookout. Another lookout, although this one is less complete. 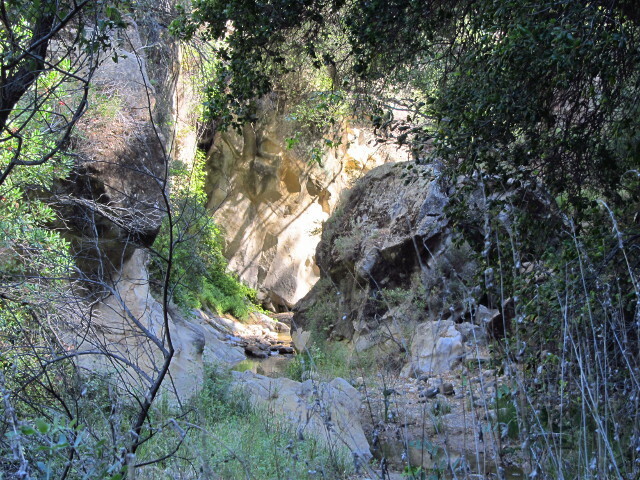 I'm looking at going down the Sespe for a hike, but there's just more and more trail that looks interesting to hit to the point it can't be done in a day. Not too far off, and a good one for a cool day rather than a warm one, is Chief Peak. I decided to head to it. Although the news was saying things about possible rain (only 20% chance), the cloud cover was only predicted to be about 68% and temperatures were also heading for a high of 68F. I got to Rose Valley Campground to start just after 8 and headed up the road past the gate. Nearly all of this route may be driven by special permit which is obtained simply by having a 4 wheel drive vehicle and an adventure pass, in season. The road is currently open and there were plenty of tire prints, but no one came while I was hiking it. The upper falls of Rose Valley is a damp, dark spot on the cliff. So far it looks like a brilliant day for peak climbing. The bleak white rocks of Piedra Blanca almost look blue to me in the light. Comparing to the closer yellow rocks, it's clear why these are named such. A few years back, I hiked out of Upper Oso for a short evening hike up to 19 Oaks, a campground that is just about 2 miles from the parking lot and is downright delightful. Since then, I have not returned to the area even though the trail continues from there and makes a wonderful entry point into the deeper wilderness areas. 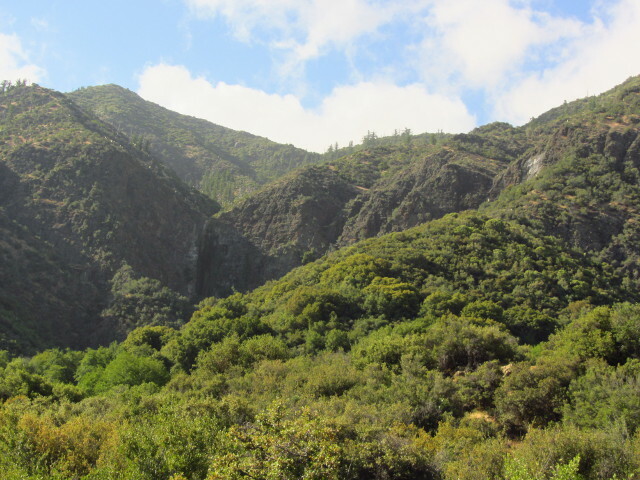 I decided to hike a bit further along this route and Little Pine Mountain and Happy Hollow Campground seemed to be perfectly reasonable destinations for such a hike. I also decided I better do it before the end of May because my Adventure Pass is expiring and I really, really don't want to hand any money over to a concessionaire such as the one operating the entrance booth just before the river crossing. Asked for $5 for day use, I showed my pass and was told to be sure to hang it. Yes, yes, I know. Then I pulled up to the river crossing. Ah yes, the river crossing. The road has just recently been opened. That means that the water in the crossing was measured to be under 1 foot deep. That doesn't mean you can actually see the cement bottom of the ford as it takes a great big curve under the murky surface. Handily, weeds are growing tall on the downstream side and there is one traffic cone on the other side. I hugged the left as I let the little car swim through the river. From there, it's just a short way to the lot at Upper Oso. 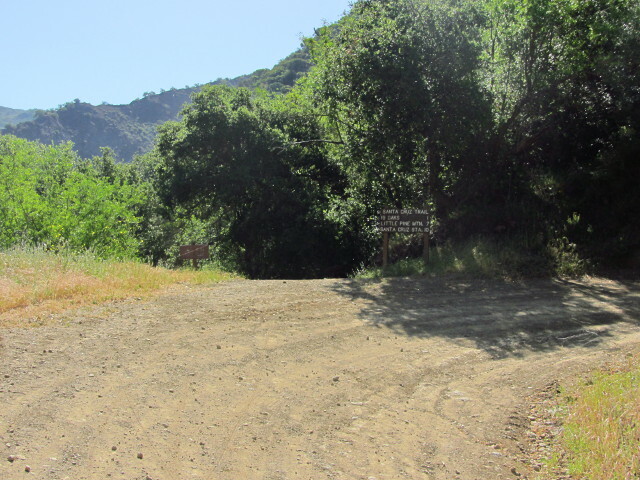 The hike starts along a road that is maintained for OHV travel and is also currently open for that. The information board is almost entirely devoted to information specific to these machines and my fellow parking lot users were all clearly here for motorbiking. Another one pulled up to use the trail as I turned down the road. It must take a while to get these things set up, he didn't pass me until I was signing the trail register 3/4 of a mile up the road. From there, it is just narrow trail and no danger of motorbikes. At the start, the canyon is narrow, especially at the bottom. The road is higher on the right. 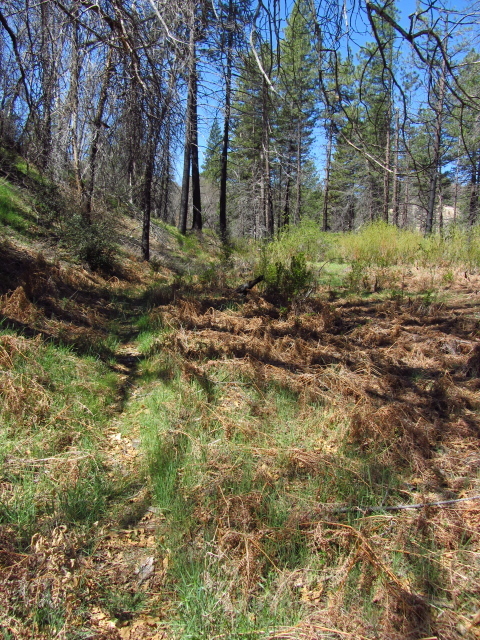 The start of Santa Cruz Trail, about 3/4 of a mile from the lot for Camuesa Road. 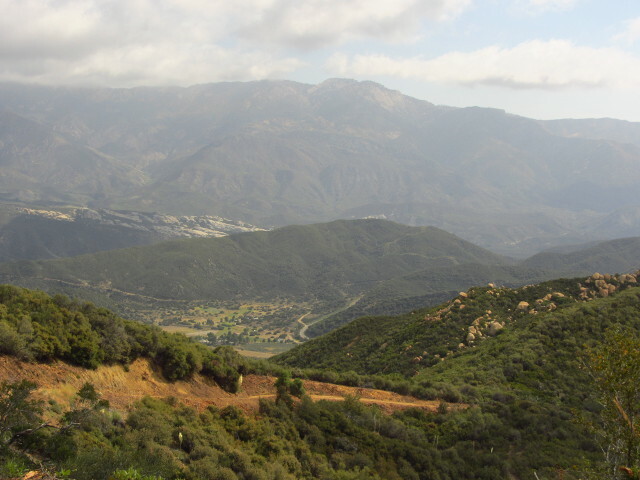 Destinations are 19 Oaks in 1 mile, Little Pine Mountain in 7 miles, and Santa Cruz Station in 10 miles. 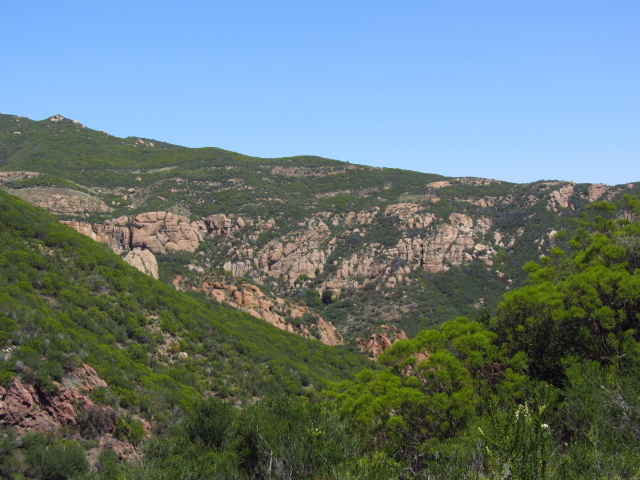 At (just) 3111 feet high, Sandstone Peak is the highest point in the Santa Monica Mountains. There are two nearby trails and connectors allow a very nice loop hike through the rocks that are actually volcanic rather than sandstone. The folks at Hike the Geek decided to head around it. There was some difficulty getting everyone to the same trailhead since the words said Mishe Mokwa while the coordinates used were for the Sandstone Peak trailhead. Cell signal meant that everyone could be collected and we headed off counterclockwise. I hear that is the unlucky direction, but it seemed a good direction for this hike putting the peak near the end. We climbed up to join the Backbone Trail, then turned right at the intersection. Left at the next intersection had us following Mishe Mokwa up through picturesque canyon. Coming around into the canyon Mishe Mokwa follows. The start of the Echo Cliffs. 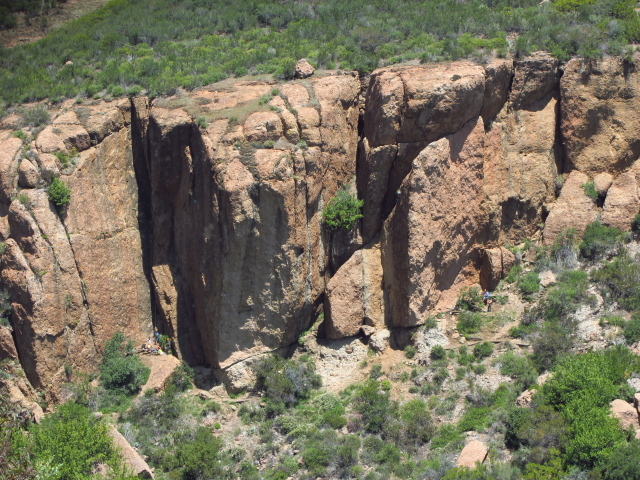 The trail passes above some rocks that are called Echo Cliffs that seem to be popular with rock climbers. We saw one group that looked like a class among the few groups on the rocks. Above the cliffs are a balancing rock creatively called Balanced Rock. Three deer walked up to the rock as we watched. The Echo Cliffs and a couple groups of climbers looking to go up them. 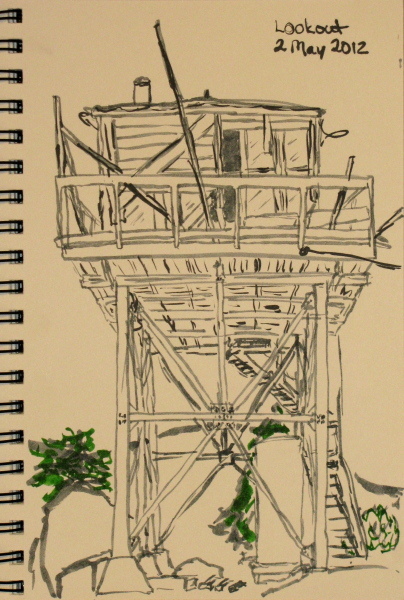 I thought it might be nice to head up to a spot where not only was there an old fire lookout tower, but it's still there and in good enough shape to poke around in. 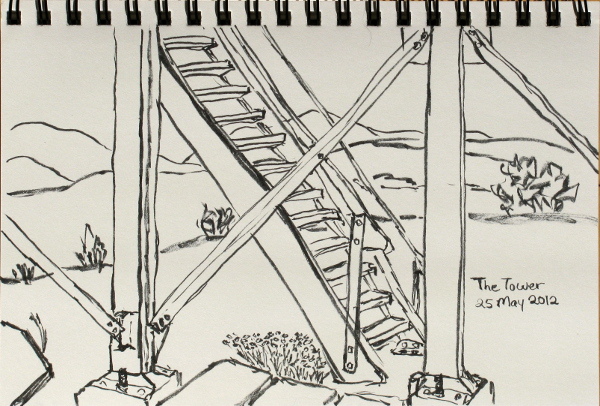 There does happen to be such a lookout with a nice hike up to it at Thorn Point. I checked to see if the road was open, but didn't see it listed among the closures because I was looking for Mutau Flat instead of Grade Valley. I did see the campgrounds up it were listed as closed. As I came into view of the road, a big white truck bounded across Lockwood Valley and stopped a short distance along the road. "Oh, no, there's a gate right there and it's closed," I thought. Then I made out the tree on the door and thought, "But he'll probably be just opening it up for himself." The ranger locked the gate open and backed out of the road again, so it seems my timing was perfect. Overall the road was very good. That and the knowledge there would be no one coming the other way along it may have lead to some overconfidence going down it that may have caused the little car to go through a bit of a stressful spot when a gravel covered hill proved difficult to stop on, but everything worked out. There are four fords, the third being the most challenging and the last one being nice since it has a cement bottom. I looked at each carefully and decided they were safe to cross, but on that third one I did pick out a very specific path first. The trail is clearly marked at the end of the road. 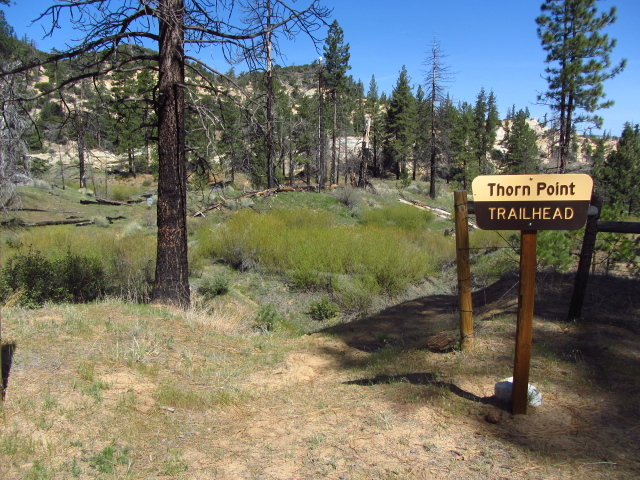 The trailhead in Thorn Meadows at the end of 7N03B. The grey plastic plaque for the wilderness is just visible to the left of the tree. The trail was obvious next to the new sign. It wiggles down into a small creek and back out the other side. There is a broken down fence with a break next to a plastic Sespe Wilderness sign. After this the trail is off limits to vehicles, including bicycles. The trail showed little recent use but is used enough in season that it is easy to follow all the way to the lookout. Here, it is soft with pine needles and shorter grasses. Drifts of stomped on grey pine cones mixed with new brown ones and covered the trail. Bunches of as yet uncrushed leaves crunched under my feet. I heard an animal take off running, then the unmistakable grunt of a bear. I caught sight of a baby bear disappearing into the woods, mama brown grunting behind the baby with her skin flapping around her. Some movement up on a ledge drew my eye to one more baby who felt trapped. The baby found its way off into some trees along the rocks. A little bit of the overgrown trail. It looks like it is kept up by walking in season, but not as much now.